Welcome to our neighborhood! If you’re looking to become a resident of the Livingston County area, you should know that “big city” health care expertise is available within minutes, not hours! OSF Saint James – John W. Albrecht Medical Center is part of OSF HealthCare, a network of 115 locations including 11 acute care hospitals, over 700 primary care and specialist physicians, more than 330 advanced practice providers, and 18,000+ employees. OSF HealthCare is a member of the Mayo Clinic Care Network, giving every patient access to Mayo Clinic expertise, while receiving care that’s close to home. OSF PromptCare is available in Pontiac six days a week, without an appointment, for life’s unexpected minor illnesses and injuries. Click here for complete list of services, directions and contact information. Virtual urgent care OSF OnCall is available 24/7, using your laptop, tablet or smartphone. OSF Saint James has been named a Top Rural U.S. Hospital, and has repeatedly earned a Hospital Safety Score of “A” from The Leapfrog Group. We were ranked the “safest hospital in Illinois” by Consumer Reports in 2013 and 2015. Blue Cross Blue Shield has also designated OSF Saint James as a Blue Distinction® Center for Maternity Care. As one of the nation’s first Accountable Care Organizations, OSF HealthCare meets rigorous requirements in better patient health, community population health and increased value of service to patients. 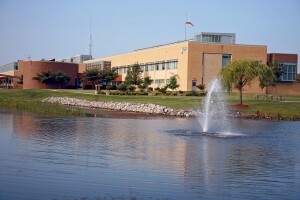 Serving the greater Livingston County area from Pontiac, OSF Saint James – John W. Albrecht Medical Center is a 42-bed acute care facility, fully accredited by The Joint Commission. OSF Medical Group offices are also located in Chatsworth, Chenoa, Cullom, Dwight, Fairbury, Flanagan, Minonk, and Pontiac. Click here to find the office closest to you. OSF orthopedic surgeon Brian Sipe consults with a patient in the office he shares with Dr. Jeffrey Lowe in Pontiac. 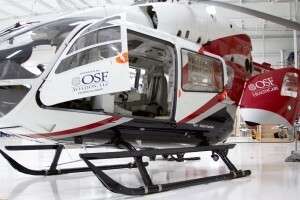 OSF Aviation provides swift transport and skilled flight nurses for patients requiring transfer for treatment of critical injuries, burns, etc.